The Hotel Torre of Sondalo is perfect for healthy, natural holidays. Many outdoors activities can be practiced all year round for an ultimate energizing experience. Strolls and walks in the mountains, trekking and excursions through the territory of the Stelvio National Park are the best way to experience the Alps. You just need a good pair of walking boots or skis to discover nature in its pure state. Silence, peace and quiet wait for you in our ancient untouched forests and on our mountain hills. In summer you can either enjoy a day out in one of the nearby Spas of Bormio or rest by the hotel outside swimming pool. The Hotel Torre is particularly suitable for cyclists and bikers. Racing bikes, motorbikes and mountain bikes can be kept in a dedicated room at the hotel to be then used on the roads of the famous Alpine passes such as Stelvio, Gavia and Mortirolo. A visit to the Swiss town of St. Moritz is highly recommended. The most glamorous and elegant town of the Alps can be reached by means of the Bernina Express, now one of the UNESCO World Heritage sites. A day shopping in the VAT-free area of Livigno is also an option for a pleasant day out and a visit to the cellars locally produced wine and liqueurs is an excellent way to give your holiday a unique, unforgettable taste. Snow is key in winter. The slopes of Bormio, Livigno and Santa Caterina can be reached by car within minutes by car, for a great, active experience in the wild nature of the Stelvio National Park. 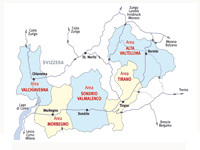 The wide ski area of the Alta Valtellina region is the perfect setting for all kinds of winter sports.